So this happens at least once a year. Every news program is overrun by reports of an extreme storm that is headed in our direction. Oftentimes, at some point in the winter, Western New York is threatened by some major “NorEaster” storm that promises to dump 5,000 inches of snow in less than an hour. Usually, they end up downgrading the storm and nothing significant ever happens. I don’t usually get caught up in this sort of stormy hype, but I must say, this FrankenStorm feels different. Everyone who knows anything seems to be in total disaster-preparedness mode! Even at work, people who are normally very leery of overzealous weather reports were preparing for the very worst. Earlier today, I made my way to the grocery store and not only were the managers in complete panic mode, but nearly every “staple shelf” was empty! The bottled water was sold out, the bread was gone, the stock of canned goods was nearly annihilated! I don’t know what is going to come of this, but let’s hope it doesn’t turn out to be anything too monstrous. Stay safe everyone! This morning was definitely a sleep-in sort of morning, but Katie and I had made rough plans to hit the gym this morning and I remembered that my favorite Total Body Conditioning class is on Mondays. Since I’ve missed the gym for the last two days, I figured I might as well go. Also, staying in and hibernating all day today was out of the question anyway as I had a dentist appointment at noon! Prior to TBC, I hit the elliptical for an interval workout that ended up totaling around 2.3 miles (and according to the calculator on the screen, scorched nearly 300 calories in just 25 minutes!). Even though my legs felt a little like Jello afterwards, TBC was a lot of fun and was filled with new moves that the instructor hasn’t really used before. It was also great to have Katie there as I usually attend those classes all by my lonesome. 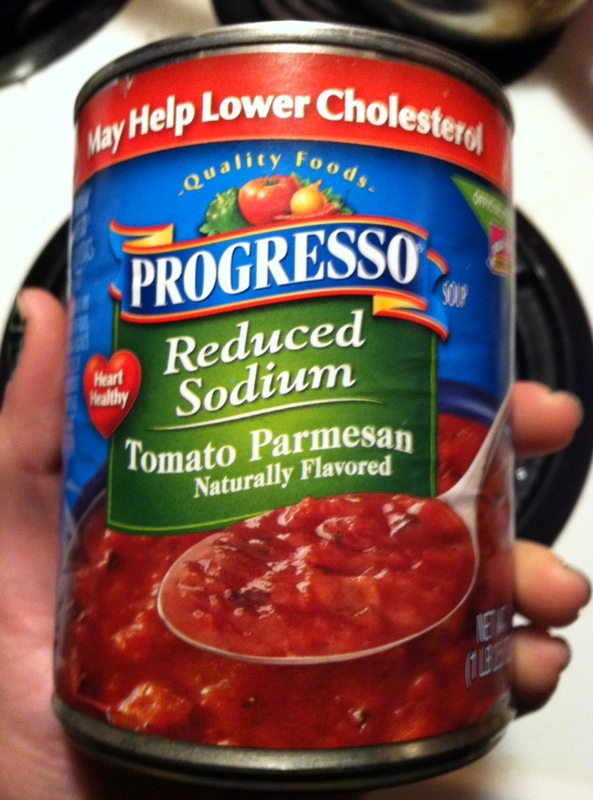 Today’s lunch consisted of a bowl of my new favorite soup: Progresso’s Reduced Sodium Tomato Parmesan. It wasn’t until VERY recently that I decided that I am a soup-lover. I have always hated any and all soups (aside from maybe one or two of my mom’s homemade varieties), but other than that, I just couldn’t get behind it. Apparently I have chand my mind 100% and jumped right on board because now I can’t get enough of it. It’s the perfect lunch and if you choose wisely, it can be a pretty healthy option as well! Today I broke up half of a small dinner roll into the bowl and it was as tasty as could be. It is also nice that this particular variety is reduced sodium. I’m generally not too worried about sodium (unless we’re talking Chinese take-out or Ramen Noodles), but I do try to make myself aware of my intake. I once did a 10-day, VERY low-sodium “diet” around New Year’s. I lost about quite a bit of weight in less than two weeks. It was certainly a good New Year’s resolution jumpstart, but overall, that turned out to be not-so-helpful. I gained the weight back immediately after I started eating normally again (it was almost all water weight from the salt), but it definitely served to show me that sodium may be a good thing to at least be conscious of! Since then, I’ve read several articles suggesting that it is unnecessary to be too much of a sodium-stickler at my age if you are in good health and maintain a healthy lifestyle/ eat well otherwise, so I have definitely loosened the reins on that rule. As it turns out, today has been the perfect combination of activity and hibernation. 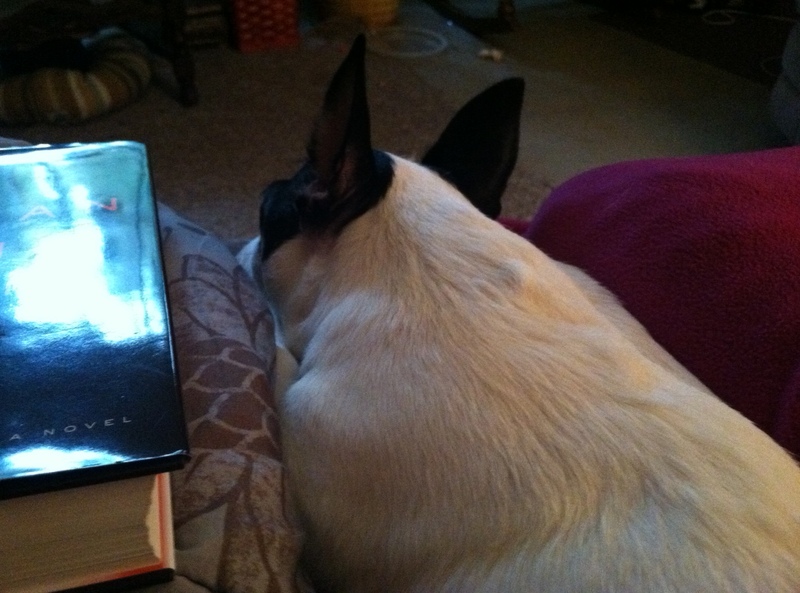 I really don’t like staying in all day anyway, but now it’s time to hunker down with a dog, a blanket, and a book and wait out this storm! Stay safe, my friends! I will see you again tomorrow. This entry was posted in Dentist, Group Exercise, Gym, Monday Adventures, Total Body Conditioning and tagged Day Off, FrankenStorm, NorEaster, Progresso, Soup, Total Body Conditioning by 5ksandcoffeebeans. Bookmark the permalink. I tried that soup and I loved it! Thanks for the idea!